I WANT THIS SO MUCH I MIGHT EXPLODE! We adore video games-inspired design at DS, and I genuinely don't understand how nobody has thought of this before. This ingenious lamp is the perfect thing for gamers, 80s design fans, and people who giggle hysterically at novelty lighting. 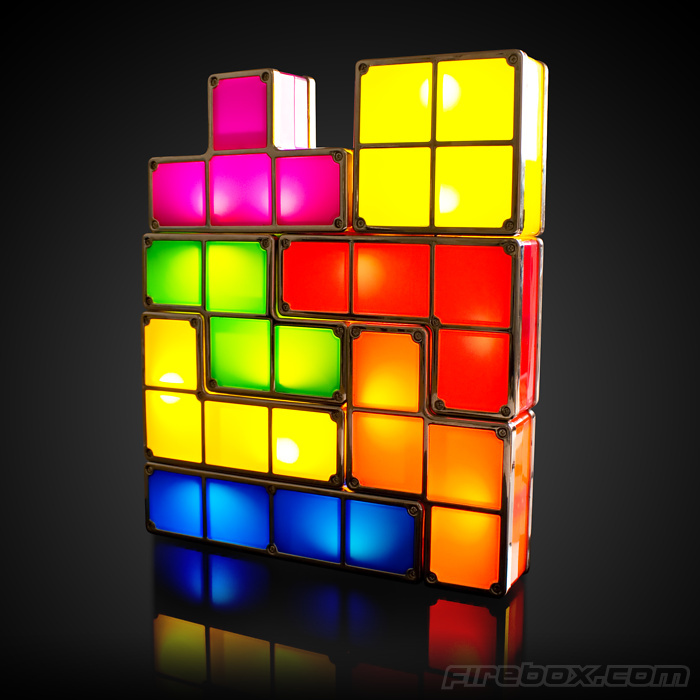 It's made up of seven stackable Tetris blocks, and as you add them to the pile, they light up. Which I adore - tiny, mini game of Tetris that can only end happily, rather than at 80mph and throwing a GameBoy into a wall. The only thing that would make this light better would be if it were battery-powered rather than mains-powered as it is, but hey-ho, the Olympics are just making me greedy. The Tetris Light is available to pre-order for £29.99 from Firebox, and if you buy it now, you will get it in a fortnight or so. They're STACKABLE. I have no interest in other lighting. All other lighting has been made obsolete. If you bought a few of these, could you make a whole light-up Tetris wall? That would be brilliant. I'd imagine so - it would just be a bit vexing with the mains wire running out at various intervals. My friend and I are going to buy a couple for our video game-themed 30th later this year!